I was excited when I spotted Layla Ceramic Effect polishes at Ulta recently. 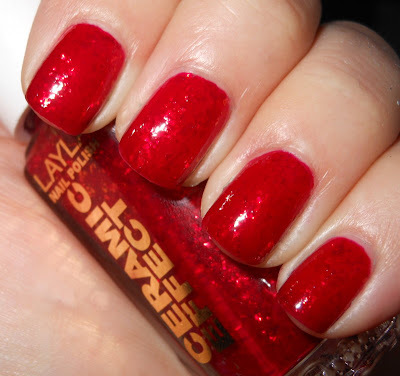 This was the first time I had seen Layla Ceramic Effect polishes in store. I instantly gravitated towards the Christmas in Laylaland display with all the holiday colors. The polishes were unnamed but did have numbers. This particular color was numbed CE 53. I googled the number, and found out the name is Killing Red from the listing on Ninja Polish. Killing Red is a cherry red jelly with golden-red flakies. This is a beautiful red flakie polish. I love jelly flakie polishes, and I wish they were easier to come by! This is also a great holiday color, and I think it would be suitable for year round. The formula on this was nice, and it applied well. My biggest beef with this polish? The price. These did not have prices on them at Ulta, but I stupidly assumed since it was grouped with the other polishes they'd at most be like $8.50. Nope, these are $9.95. I'm not a fan of spending this much on polish when I'm just casually shopping for a few things at Ulta if you know what I mean. This is a nice polish though. I bought my first 2 Layla polishes just a week ago when I flew out to a GIANT city for medical. I finally got to go to my first ever Ulta store. I had not really paid attention to what brands they carry but squealed when I saw the Layla display. They did not have this shade as I know my eyeballs would have pulled me right to it. I also like jellys that have 'stuff' in them! While I wear all ranges of reds, this kind of warm one is my fav. I completely agree. You can wear this one yr round but it is perfect for holiday. I also dropped the 2 bottles into my basket with no idea how much they were. That's one thing I really did not like about my trip into Ulta land...nothing had prices and I still cannot figure out how to use the bar scan reader app on my phone! I am pretty darn good with techie things considering I hale from the old slide ruler age pre pocket calculators! See...us polish hounds come in all age ranges! Thanks so much for showing this one. Despite the $$ on Layla, I would pick up a few more. I love the 2 I did buy. I love this color! There's a green glitter in this collection I've almost picked up a couple different times, too. I don't get the Ceramic Effect thing, though. I understood it to mean a satiny, slightly matte effect when I first saw Ceramic Effects, and they were cremes so it made sense. But obvi that's not the case here, lol. Stunning!! I agree that it's pricey! So pretty but man do I not like that price! I seen some of these polishes and passed them up just cause its so hard for me to pay that much! Wow, this is so pretty! Quite expensive though, not sure i'd pay the price. I tried the tester at Ulta and agree with you on both major points-this is a really beautiful polish, but it's definitely too pricey. I can't bring myself to spend that much on a polish, especially since you could probably mix a red jelly and Hidden Treasure style flakie to get a similar result. I *almost* picked this up, but picked up the purple/blue flakie instead. Might need to go back and pick this one up, its gorgeous! I miss you Christmas lights. So beautiful. I managed to get this one on clearance. I thought the name was Rudolph!